Dental Offices: Please place your order for this product here on our website instead of calling us. If you have Invisalign clear plastic aligners, your orthodontist or dentist may have instructed you to use these "chewies." Biting down on these firm foam cylinders helps to seat your aligner and make your treatment proceed more smoothly and quickly. With proper care, two Aligner Chewies can last for the duration of one tray (aligner). They can be cleaned with soap and water, or diluted mouthwash. They are disposable. Available in white color (unflavored, unscented), or in several colors with scents. Use only as instructed by your dentist or orthodontist. Each pack contains 20 Chewies (10 individual little factory-sealed bags of 2 chewies each). Buy a pack and you'll always have them on hand when you need them! Convenient to throw into your purse or briefcase since they're packaged in bagged sets of two! Invisalign® and Vivera are registered trademarks of Align Technology, Inc. This product is not manufactured by Align Technology. An Aligner Chewie is a small cylinder made of a soft spongy plastic-like material called Styrene Copolymer. It looks like a small roll of gauze or cotton. You get 20 Chewies per bag (10 individual little factory-sealed bags of 2 chewies each). Biting on an Aligner Chewie helps to seat your Invisalign aligner onto your teeth so that your treatment can progress faster. Check with your dentist or orthodontist for specific instructions regarding how often to bite on the Chewie. Read our article on How to use Aligner Chewies. Aligner chewies are a convenient way to get your Invisalign aligner to seat on your teeth faster. Bite on them 5 minutes before bed, or as your orthodontist or dentist recommends. Love the firmness and they don't crack like the similar ones I purchased from Amazon. Be careful, though, because the;re slippery little suckers! ConsSmall, easy to lose or accidentally swallow so be careful! I have purchased similar Chewies through other companies while using my clear braces. 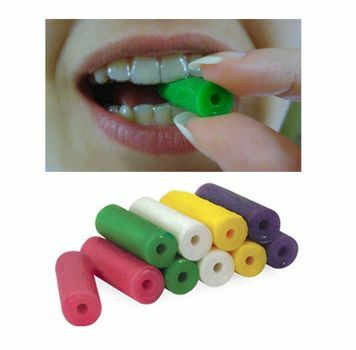 These are the perfect consistency to chew, extremely durable and a great value. I was disappointed with other brands practically disintegrating at first use through cracking and unrolling. Dentakit Chewies are absolutely the best ones on the market. I have been singing their praises to everyone! I ordered the Chewies ahead of my invisalign treatment. The product arrived quickly and since I ordered the grape scented ones, my box smelled great. The chewies help a lot in making sure my aligners are in tight, without the struggle of pushing on the trays with my fingers. I am glad this came with 20 of them since I will be using invisalign for 2 years. Our practice really likes offering these to our patients. We have used other brands and find that we like these the best. These are kind of strange things but they work. When I chew there is some noise because there is a hole in the center, but the chewing helps to fit my retainers tighter, so that is good. Minty fresh and easy to carry with you. Great for keeping invisigns tight and secure and minty fresh taste. I have them all over ! Bathrobe pocket, pockets, handbags , bathrooms, car! So many! So cheap! So helpful! I am still on my first set and I have so many left! I am honestly thinking of giving the rest to my dentist because I probably won't need more than just one or two. The chewies are great for that tight invisalign fit as well as for simple boredom. At first, I worried that the scent would be noticeably strong or would leave a bad taste in my mouth, but they are so very mild that I didn't have to worry about it at all! ProsComfortable and soothing. Don't need to use my tongue or finger to tighten the invisaligns. ConsSo so so so many more than I thought I would need! Went through the "chewies" provided from orthodontist sooner than expected and needed more. As I like to chew gum and cannot while wearing Invisalign, the "chewies" were a welcome alternative. Thanks for the quick turn-around from order to delivery, within 4 days. Which included weekend before a holiday. Fast service. Pineapple didn't have any flavor but they are great for alignment. Merchant Response:The Aligner Chewies are scented, not flavored. Same quality chewies as the ones given to me by my orthodontist. Grape smells and tastes great -- smell and flavor lasts for a whole week. Bubble Gum chewies were a disappointment. Smell and flavor was gone after the first few minutes of use. These chewies are perfect for getting your invisaline to sit correctly on your teeth to help them work the way they are meant to. The chewies made the invisalign a lot snugger and does not smell at all. Washing it after every use or as soon as possible will not leave a bad smell. I probably will buy another pack later on since I have to wear these for a year. These are great, they help set the aligners in place easily. Take them with me and use at home. Great for seating Invisalign correctly. Nice tight fit. Just as I expected. Helps moving forward with the treatment. Thanks.